Hey guys!! Did you all have a great Thanksgiving? We did – beautiful weather and lots of family time, plus our littlest one turned six months old (how did that happen already?). 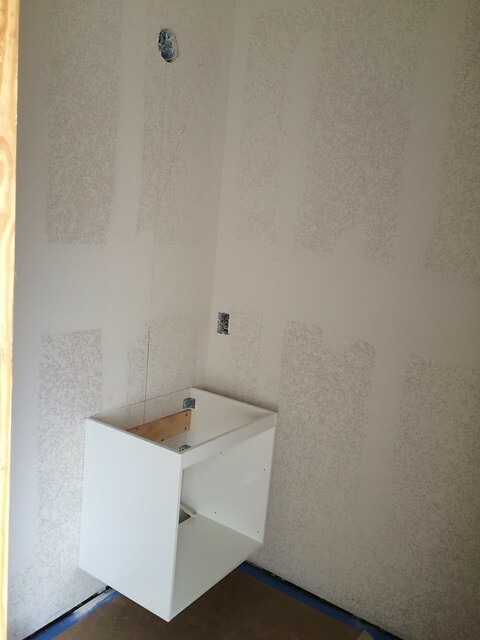 – The laundry room addition is finally bricked in and IT LOOKS AMAZING. 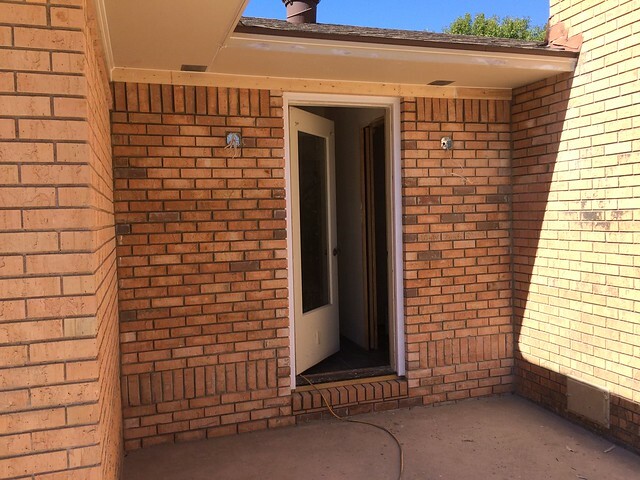 Thanks for the push to add brick instead of sticking with the siding – it makes the addition completely seamless, AND it gets rid of that weirdo alcove between the laundry room and the fireplace (you can see it in the “before” photo below). 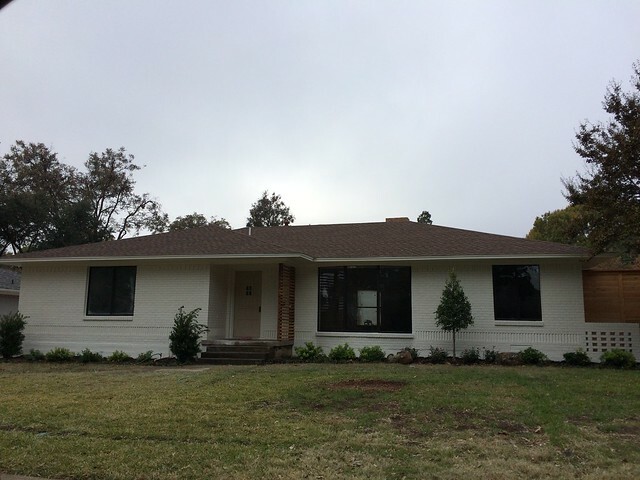 – The landscaping got a fresh new look . . .
. . . and the exterior brick has been primed and painted. – I TRACKED DOWN THAT DANG VANITY and it got installed, along with the rest of its friends. I drove through Hill Country a few weeks ago to a bachelorette party and was able to convince the friend I was traveling with to stop at the Ikea in Round Rock – I had been stalking their inventory online and they had ONE vanity. I made it mine. 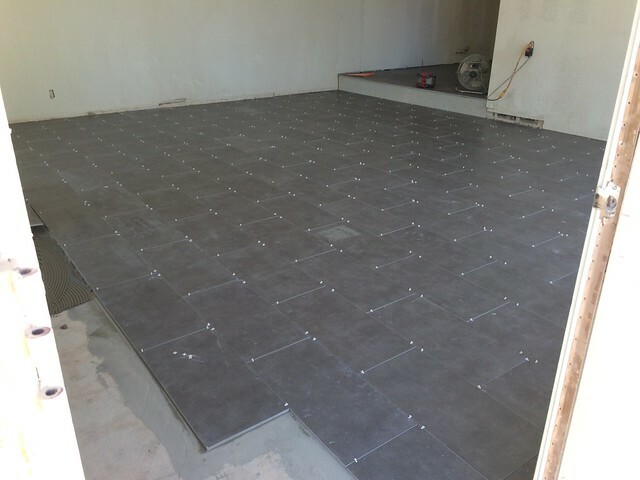 So the tile looks all happy and perfect in the back den, but you would not believe the amount of prep the tile guys had to put in to get the concrete ready for tile. 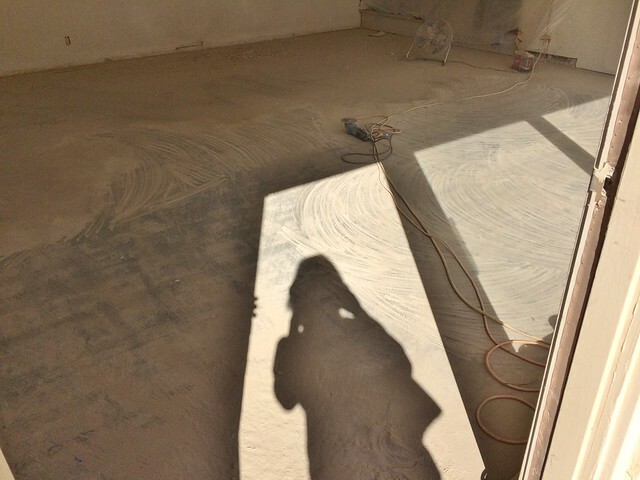 After scraping off layers of linoleum, they had to sand every last speck of glue off the concrete. See that photo below? I took that from the back patio, looking into the den. Yeah. That’s a lot of dust. 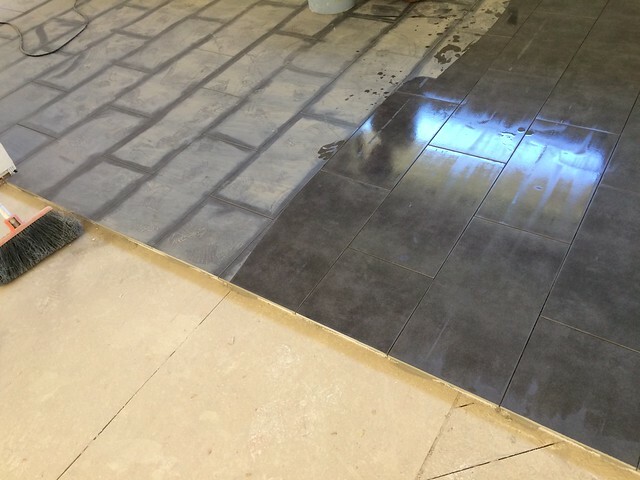 I felt so sorry for the tile guys that day! After the dust settled, there were piles of it everywhere. They taped off the den from the rest of the house to keep the dust out, but you can see in the photo below that the pesky dust still got everywhere – on the left you can see the layers of dust on the kitchen floor (the grout lines had been vacuumed), and on the right the tile has been wiped down. Crazy! 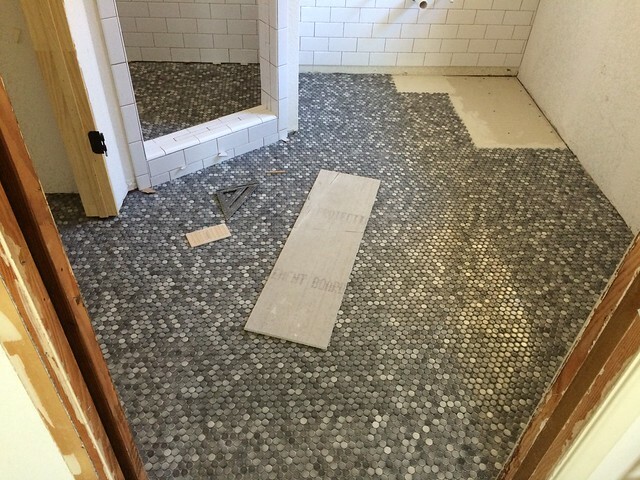 The bathrooms all got their own little dose of tile – I particularly love the penny tile in the new bathroom we added off the office/4th bedroom. We used it in our 9th flip and I just had to use it again! 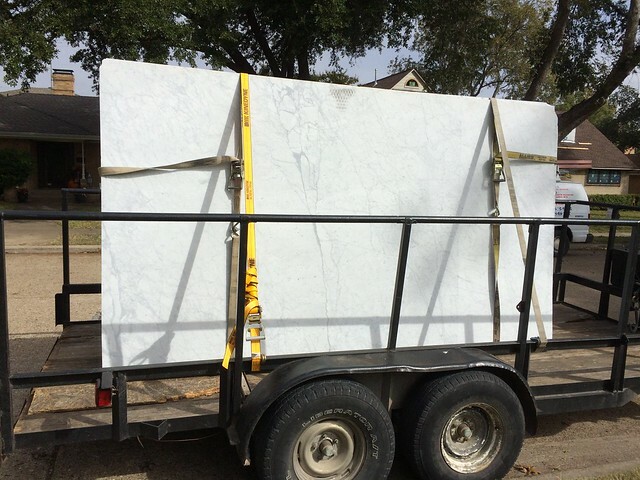 – All the bathrooms and the kitchen got gorgeous carrera marble counters. 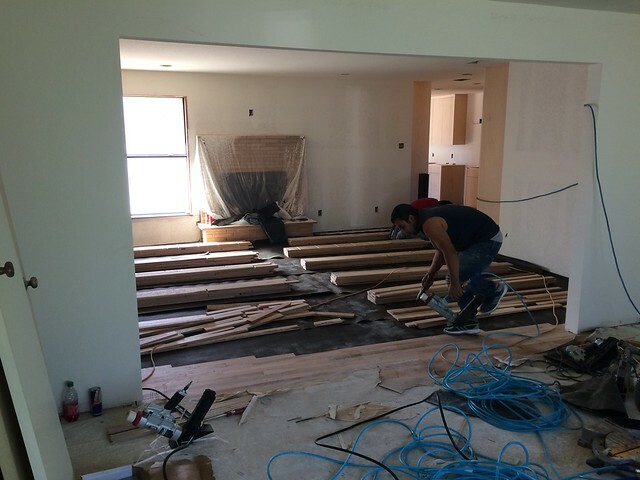 – The wood floors were installed. 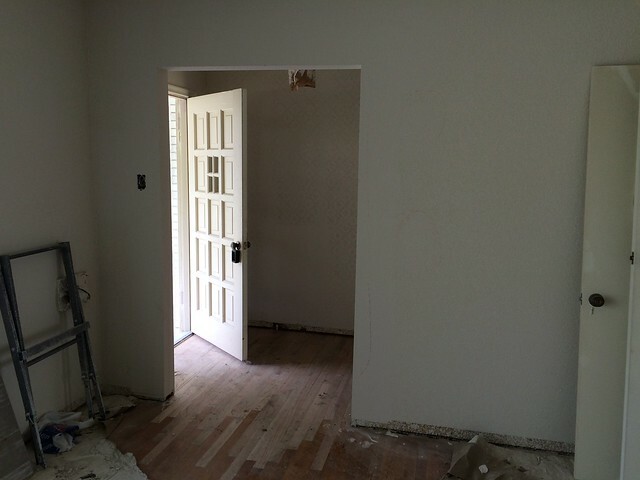 Much of the house has original wood floors, so new wood was only added in the living room and entryway. 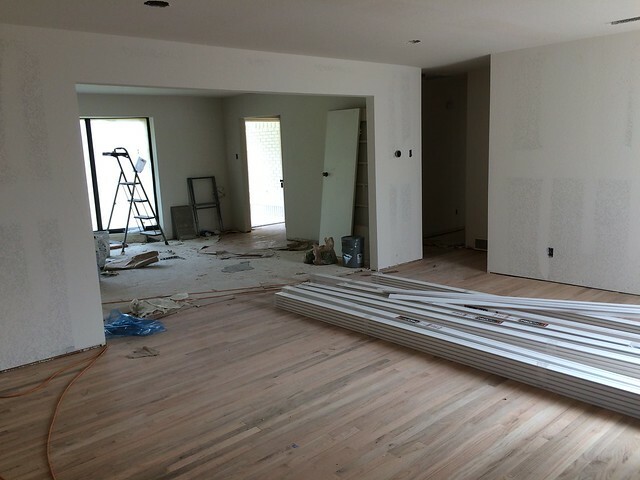 The painters are hard at work right now on the interior – I’m hoping they’ll be finished by the end of the week, and then we can start installing all of the lighting and plumbing fixtures – my favorite part! Amazing! 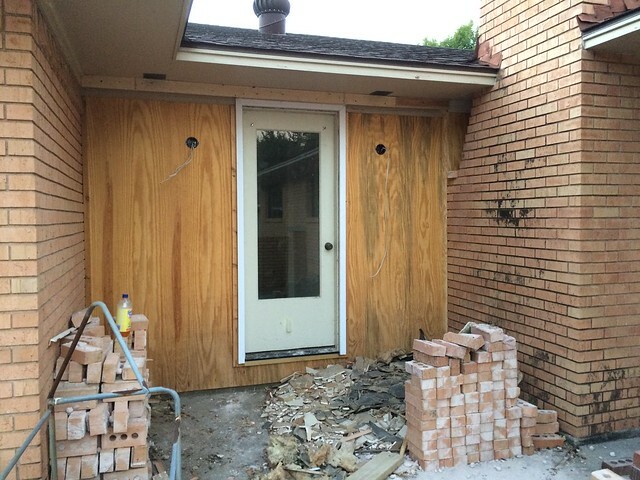 The tile, the counters, the bricked alcove, the primed brick – I can’t wait to see it all. And I’m so excited to see the ninth, as well! Woohoo!! You got that stinkin’ vanity! Thank goodness it wasn’t dinged up when you got it back home! Great to hear from you on the progress. 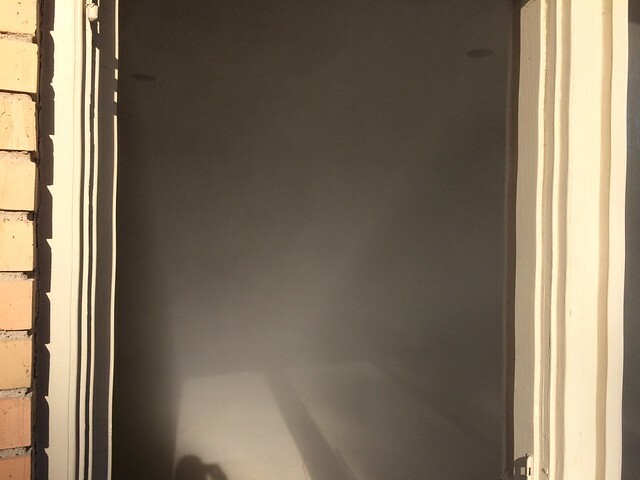 Yikes on the dust and tile. 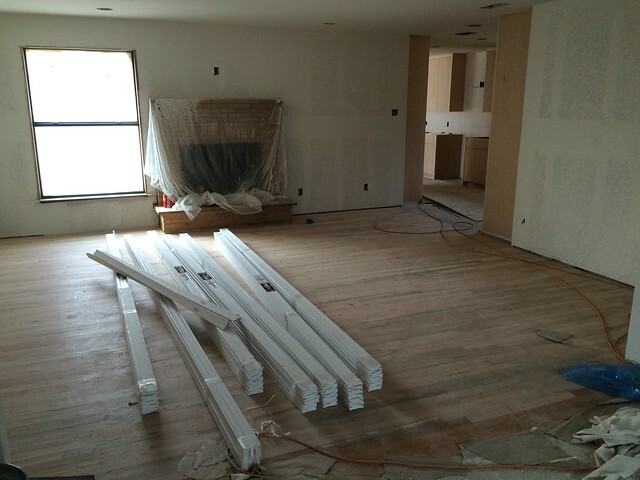 We will be tiling in the future and the laminate wood floors are over concrete now. 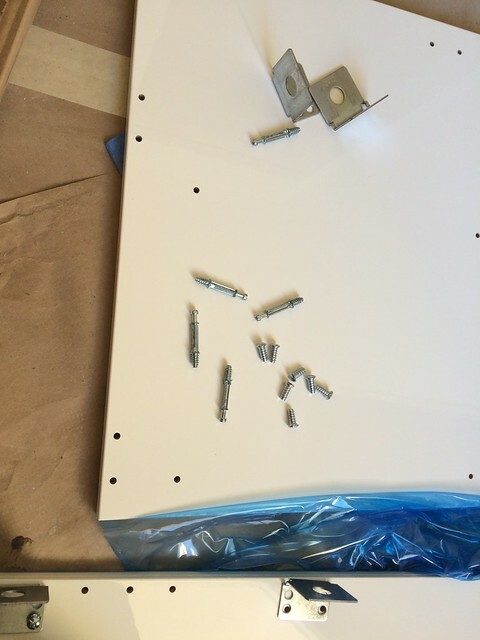 Uh-oh…as long as there is not a bunch of linoleum we should be ok, right? The house was built in 1969 so I should not be surprised to see linoleum in the lower level I guess. The brick looks better already. We are investing in our outside this coming Spring. 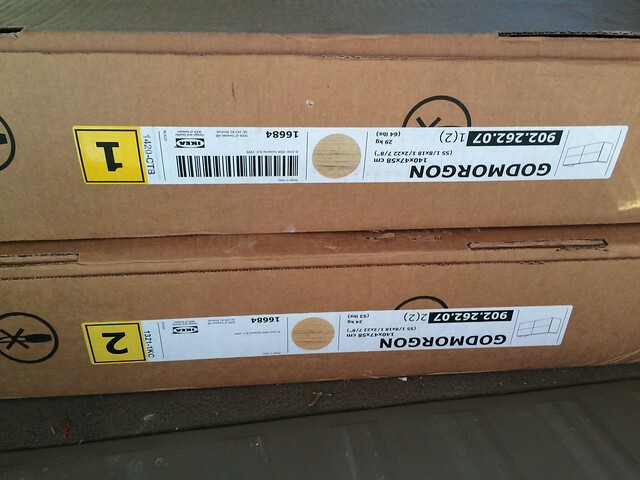 I am SO excited–new paint, shutters, light fixtures, driveway expansion (daughter will be driving! 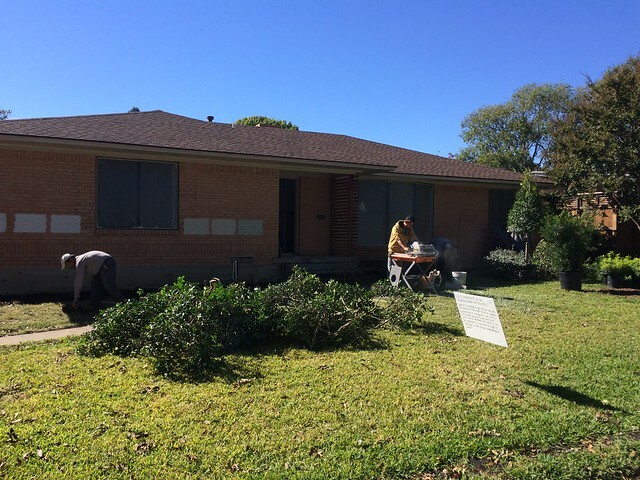 ), landscaping, trees…so much fun!! Glad you had a great Thanksgiving and I hope the rest of your holiday season is wonderful. How could it not with two sweet little ones and a job like yours (and a great hubby)?! Would you provide the source for the penny tile please? It’s the perfect color for my kitchen backsplash! Wow! That is a huge amount of progress, and I love it all! I want some penny tile somewhere in my life. Can’t wait to see the newly tiled den. Amazing amount of prep, but it will be worth it. I am really looking forward to the next set of pictures. Yea for you for stalking the last remaining IKEA vanity. Loved the post! It’s really looking fantastic – looking forward to seeing more! My house is that yellow brick, which I’m not a fan of, but everyone’s telling me not to paint the brick because it will require repainting, whereas brick is hassle-free. Can you give me some advice on that? How long does painted brick hold its paint, in your experience? And I’m assuming having it painted is cheaper than having siding put on it, right? Hey Kathleen! Having it painted should be a few thousand, whereas siding it could be double that – plus, brick is so lovely! The brick shouldn’t need repainting often – assuming you don’t get any cracks in the brick joints, your paint job could last you decades. Your trim will need to be repainted every 5-10 years (but that’s the case no matter what you do). So, in a nutshell, if you hate your brick I would paint it! Thanks, Liz! I definitely will put that on my wish list for spring! You know I hadn’t thought much about this before but along with you creating a wonderful new home for someone, your also giving many people the opportunity to have jobs. Your helping in two different ways and I love it. And my Thanksgiving was truly a blessing this year:).